Taking a bath is a practical task necessary for cleaning and washing our bodies and maintaining good skin condition. However, bathing has long since had many less practical connotations too; historically bathing was a social event and now many see baths as an opportunity to relax, unwind and forget the stresses of everyday life for a short time. A long hot soak in the bath can be restorative; it can ease muscle tension, clear stuffy heads or simply offer a moment of relaxation and peace in an otherwise hectic world. Yet as we get older, taking a bath becomes more difficult and the pleasure and comfort of a soak can be marred by worries and ailments which prevent total relaxation. Slips and falls are by far the most common concern and often occur as people get in and out of the bathtub. The slippery surfaces in a bathroom, with the addition of water and the residue of beauty products, means getting a firm footing is very difficult. Non-slip suction mats or rubber silicone appliqués in the tub can help prevent falls, as will a non-skid bath mat on the floor beside the tub. Yet these are not foolproof solutions. While falls tend to be the primary concern, there are other common issues which affect the relaxing properties a bath offers, most of which can easily be negated even before you decide which model of bath lift is best for you. It is common to feel the cold more in later years, so stripping down to get into the bath can be particularly chilly. This is heightened when getting out of the bath as your body is still damp and the room is likely to be colder than the water in the tub. Ensure the bathroom is adequately heated before you get into the tub and keep the heating on throughout the duration of your soak. If you can, place towels on a heated rail or radiator so they will be warm when you come to wrap yourself in them. It’s difficult to tell with your hand how hot your bath water is and tricky to manoeuvre to dip a toe in, at the risk of falling. Invest in a heat sensor that sticks to the side of the bath and changes colour if the bath water is too hot or cold. Give yourself plenty of time for your bath. Rushing can increase the risk of an accident. Make sure you have enough time to warm the room up first, run your bath how you like it and take your time when soaking and drying off. Not only will this decrease the chances of injury, it will increase the pleasure and restorative properties of a bath. Getting in and out of the bath is a challenge that often prevents people from enjoying baths in later years. However, there are methods and equipment that can make bathing a pleasurable and independent experience for all. This case study will explore how to safely get in and out of the bath, as well as give some tips on useful equipment and accessories and how to enhance your bathing experience. Modern bathtubs are focused primarily on design, rather than ease of access. This means they are tricky to get into, regardless of age but as mobility is lost in later years, getting into a bath becomes ever more challenging. Leg strength and flexibility are needed simply to lift a leg over the rim of the tub, then balance is challenged through shifting weight to lift the other leg in. Even then, lowering oneself down to sit in the tub tests flexibility. There is no one right way to get into the tub, it will depend on the issues faced and the positioning of your bath, however there are a variety of different aids and accessories available that can make the process much easier. The most common and perhaps easiest bathroom modification is grab rails. These can be positioned at various places around the tub to give support when getting into the bath; the nature of bathrooms means there is often nothing else available to hold onto. It’s important to note that grab rails are only suitable for baths that are positioned up against a wall and need to be attached to a solid structure If the plaster is loose the damp conditions mean they will not stay securely in the wall. Grab rails should be used with a clean dry hand too as they do get slippery when wet. A bath board fits across the bath; you sit on it and lift your legs over the rim and into the tub, you can then wash from there. Using a bath board means you don’t have to get right down into the bath tub; which is great for those with limited flexibility, making both getting in and out of the bath much safer and easier. However, using a bath board does mean you won’t be immersed in water; which will take away some of the relaxing properties of bathing. You will also need to make sure your bathroom is nice and warm before taking a bath. Steps are a great, cost-effective solution for many people, particularly for those who simply need help with the step up into the bath. There are a wide range available, some with one step, others with multiple and some that come with handrails too. They can be combined with other solutions but as they are not a permanent fixture it’s essential you use bath steps with a non-slip mat underneath them to prevent movement when in use. 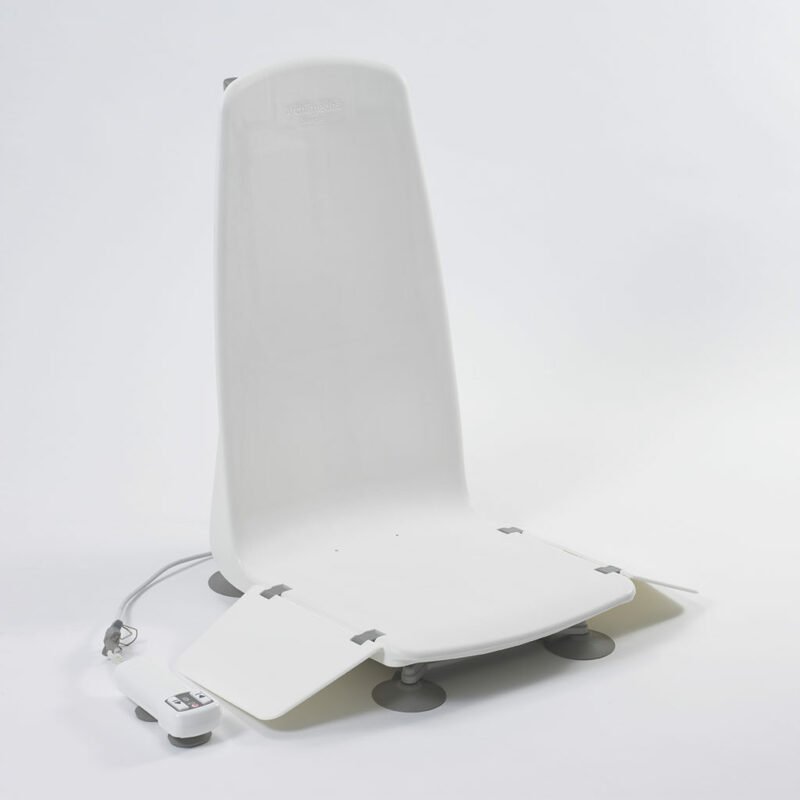 For those with more complicated mobility issues or disabilities, a bath lift can be life changing. Bath lifts mechanically lower and raise you in and out of the bathtub, requiring very little physical exertion and almost entirely eliminate the chance of injury. Some give minimal back support and are ideal for those with reasonable upper-body strength, others offer full body support both during the lifting process and whilst bathing. Unlike standard bathtubs, walk-in baths focus on accessibility rather than design, making it much easier to get into the tub. A ‘door’ in the bath panel removes the need to take a big step up into the bath. Most walk-in baths also have a built-in seat, eliminating the need to lower oneself down onto the base of the tub. The nature of walk-in baths means you must get into the tub before beginning to run the water and then wait for all the water to drain before getting out, this significantly extends the time taken to bathe and once again means bathrooms must be kept warm in order to avoid getting a chill. Walk-in baths, though cheaper than they used to be, are still an expensive bathroom modification and if you share your home with others they will need to be comfortable in using the modified bath too. For anyone with reasonable back support bathing cushions offer a simple and highly effective solution. Just as with all bath lifts they lower you down and raise you back up again at the touch of a button. The key and very important difference with a bathing cushion however is that they allow you to lie down completely in the bath so your entire body is covered with water: just like having a proper bath. As an elderly person, having an enjoyable soak can be a truly relaxing/invigorating experience but there are always the issues of mobility when considering whether a bath is truly worth the effort. Sometime getting out of the bath is perhaps more difficult than getting in. Generally the step down to the floor is further (as the bath will be raised off the floor) and the residue left on the tubs surface from soaps and other products used whilst bathing can make it much more slippery than normal. A common way to make getting out of the bath safer is to use a non-slip mat on the base of the tub and to use a towel to dry off the walls or any other surfaces used for balance or support when exiting the bathtub. This is to ensure a good grip can be achieved. Many people choose to get out of the bath and then dry themselves, however damp skin and soap residue mean it’s much safer to dry off before getting out of the bath to lessen the chances of slipping. Many of the pieces of equipment listed in above will help you to get out of the bath too however there is more need for arm strength in order to lift yourself out of the tub, to a standing position. A solid grab rail, positioned low enough down to be reached whilst sat in the bath, will make this manoeuvre much easier. It can be worrying if you are unable to lift yourself up after the first few tries and understandably many people begin to panic, fearing that they may be stuck in the tub. If this happens, sit back down for a few minutes and try to calm down, taking some deep breathes. Panicking will make getting out of the bath much more difficult and you’re likely to rush and be more prone to slipping. One solution provides the perfect bathing experience. When getting in and out of the bath becomes a problem, a bath lift really can help youre discover the pleasures of having a soothing warm bath. We understand that we all need a little help sometimes and we take pride in producing easy to use and often life changing products that will help you remain safe and independent in your own home. 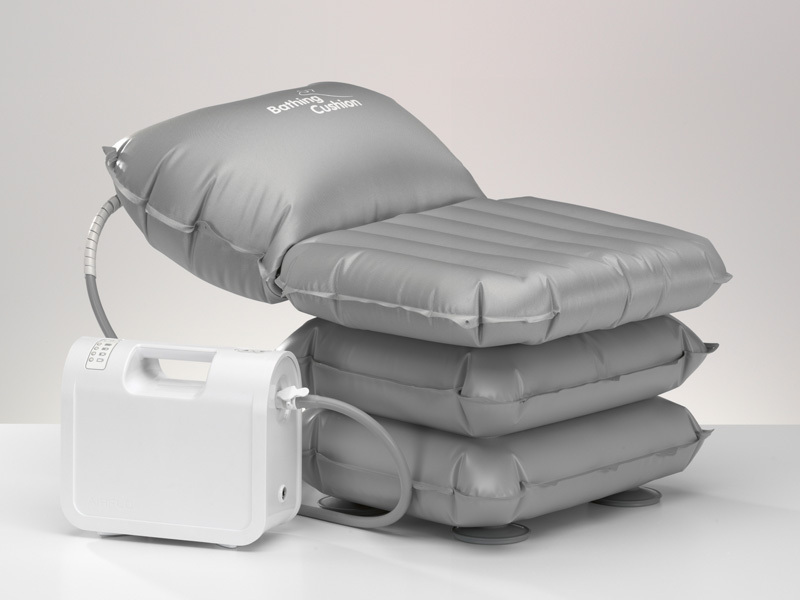 Indeed it was over 30 years ago that Mangar created the first ever powered portable bath lift, designed to help lower and raise people in and out of the bath. We now offer two very different bath lifts, the Inflatable Bathing Cushion and the Archimedes Bath Lift: two solutions that avoid the disruption of installing walk-in baths or showers. The Bathing Cushion is ideal if you have reasonable upper body strength. Simply place the cushion into the bath, inflate it and then sit on it and swing your legs into the bathtub. Once you’ve pressed the button to lower yourself gently into the bath you can choose to release the cushion’s air, allowing you to lie back and fully relax making it one of the most easy to use and comfortable bath lifts on the market. The cushion is lightweight and portable so it can be easily stored away, making it ideal for those who want total independence in the bathroom. Its portability also means the Bathing Cushion is ideal to take with you when away from home, perhaps when staying with friends or family. The lightweight, battery-powered Archimedes Bath Lift has a high backrest and long seat making it comfortable for those with back problems. The design maximises leg room and provides a reassuring and comfortable fixed position so you can still relax and enjoy the full bath experience. It is easy to remove from the bath with its unique sucker release system and its smooth lines make it simple to clean. Both our bath lifts have been subject to trials and assessments by end users and healthcare professionals and are enjoyed by customers throughout the world enabling them to enjoy a safe and relaxing bath. Anyone who has been advised they do not meet Local Authority criteria for issuing equipment but would still benefit from Mangar products can take advantage of the OT Referral Programme. For more information, download a leaflet from the website here>> or call us on 0800 2800 485. Bathing is something that should be enjoyed and benefited from regardless of your age or mobility. As time goes by this may mean making modifications to your bathroom, bathing habits or the products you use but age should not stop anyone from having the pleasures of a relaxing soak in the bath. We hope this case study has shown you how dedicated we are to creating the perfect bathing experience for you? It is natural for these concerns to be present but they should not impede on the bathing experience. Through small modifications and planning, a simple and safe bath routine can be created, allowing the indulgence of a bath to be enjoyed freely and independently. The first step in altering your bathing routine is to understand what aspect you struggle with most or that causes you most worry. By identifying this you can decide the best approach to bathing and work out which equipment or accessories will be most useful in overcoming these issues. In order to help you on your way to a thoroughly relaxing, indulgent and most importantly safe, bathing experience we’ve taken this opportunity to introduce you to our own range of products. Designed and built with the primary aim of helping you live a full and independent life!